The swing creaked gently in the moonlight. The girl in the Weaving Mistress robe appeared to be asleep as the moving bench swayed lightly. Two robed women stood holding each other as they watched the swing. Another robed woman also stood watching and debating what to do. Mistress Superior. The responsibility fell on her. The swinging girl was dead. “And you are sure that is not the case. A deep sleep. Done with herbs perhaps?” asked the senior woman. A reaction of horrific recoil put the swing in motion. After that moment of shock, the ranking mistress sprang into action abruptly. She grasped the dead woman by the shoulders and managed to pull her off swing and down the porch steps. Between the three of them, they were able to get the body across the back of a horse. One had no choice but to mount with the corpse and hold her tight as the other led them away. One remained behind to clean up and make sure no one else at the residence awoke and gave any type of alarm. The two women on horseback with their burden were soon deep within the woods adjacent to the fort. They scraped the earth with their hands until there was a shallow indention in the earth, weeping as they laid the body in a quickly dug shallow grave. They raked dirt, branches and small stones to form a coverlet. One woman, working at the corpse’s feet, appeared to finish first. But the Mistress Superior rose. “Her face is uncovered,” the kneeling woman protested. “We must leave her thus,” said the other, shaking the dirt off her clothing. It was dark but there was moonlight. The two women could see each other’s eyes. The Mistress Superior pulled a long knife from her pocket. Without waiting for the others reply, she quickly knelt back down and cut open the cheeks of the dead woman. Then she raked the knife over her forehead. The other turned away, weeping again. “We must then say the chant for her,” the other said. “So did I.” The more practical woman pulled the other up from her knees. She grabbed her by the waist and kissed her. They began to slowly chant. A funeral chant, slow and mournful. Major Spears Plate was astounded to see a woman robed in a rather provocative shade of red coming into his office, which was adjacent to the soldiers’ barracks on the opposite side of the courtyard from General Leshoward’s home. “My sympathies,” he said, with all the sincerity he could summon. He flushed and turned aside, his back partially to her. Her expressive eyes surveyed him with suspicion. He still did not turn to face her. “I’m visiting friends. The Meltons. I’m here to see you because I’m concerned about their daughter, Hortense,” said Ruthanne. “Concerned? In what way?” asked Major Plate. She gave him a sly look that he did not know what to make of. He was disconcerted, looking away again. “May I call on you as soon as I find out any information about your friend?” he asked. “I believe there is such a person. I have not met her personally. Fortunately, I enjoy excellent health. We don’t have a doctor in Fort Leverage yet. I understand she does a good trade,” said Major Plate. She handed Major Plate a small round portrait of a young blonde girl. 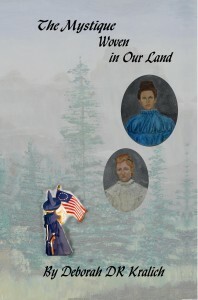 The fair girl was contrasted against the background of the American flag and wore dark blue clothing with a rather strange hat. Still, her face was clearly drawn. Their eyes connected strongly as he let her out the door. He followed to her horse and helped her mount. She looked down at him for several seconds before riding towards the gates. General Leshoward had returned late from his short trip and gone straight to Major Plate’s office for a report. The small separate building that Major Plate used as an office also functioned as his quarters. General Leshoward respected the major’s duty free hours and did not bother him there at those times unless it was important. The general considered Major Plate’s surveillance of Abigail Fichton important. The junior officer had no idea why. “Obviously. Or maybe there were three of them. I’m not sure I was ever following the real Abigail Fichton at all. Remember, I have never seen this woman up close or in daylight. And they are now wearing those veils,” Major Plate said defensively. 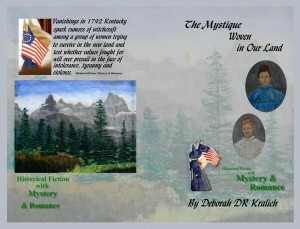 “Am I the only one that sees this Weaving Mistress group as a perfect cover for theft or smuggling?” asked Major Plate. “The group is gaining more and more acceptance in the colony. Congressman Craig’s wife has joined,” Leshoward said. “Henri Mannstein is making an open accusation of witchcraft,” General Leshoward said worriedly. “He’s worried about witches? Where does he think he is? Salem in the 1600s?” Major Plate asked, finding it hard to take the rumors seriously. “At least the Mistresses do not live separately from their families of society,” Major Plate allowed. “It is the way she lives,” the major said, wondering exactly what the word phobia meant but not wanting to seem ignorant by asking. “There is more talk about Abigail Fichton living in the woods doing miracles with her herbs and potions than about any activities associated with the Weaving Mistresses,” Leshoward said. “Mannstein claims that she is one of the Mistresses. He claims she is practicing religious witchcraft and he’s threatening to bring charges against her,” Leshoward said.